Marfa is coming to Austin for this one-of-a-kind pop-op party. 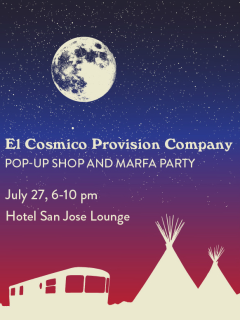 Hotel San Jose is bringing you a some of El Cosmico's signature times, such as the DS & Durga fragrance, the handmade ECPC Apothecary line, Fort Lonesome jackets and custom textiles. Guests can enjoy special cocktails and cosmic tunes from DJ Feeln' Groovy while they shop.